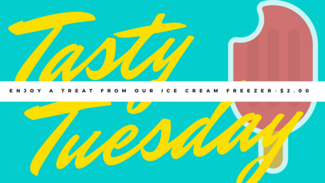 We have Tasty Tuesday each month, which raises funds to support our amazing programs! Students bring $2.00 and get to choose a frozen treat from our ice cream freezer. We are looking for volunteers to assist with this process on designated Tuesdays. If you would like to help, choose one of the Tuesdays below and click to volunteer! Responsibilities will include handing out ice cream and helping students walk quietly through the office to make their selections. It's a fun way to help out!